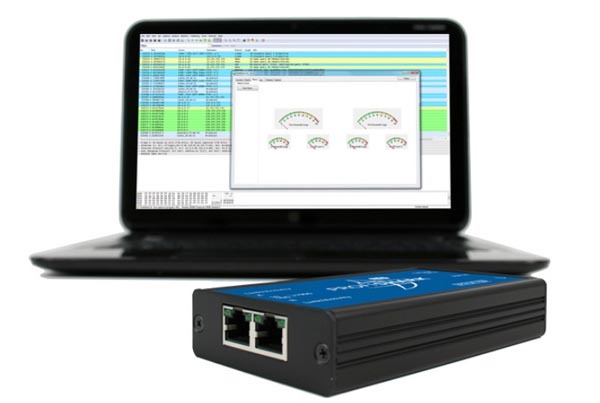 Keepin‘ your eyes on Ethernet has never been easier – with ProfiTAP. Der ProfiTAP ist eine nutzerfreundliche und effiziente Lösung. Die integrierten oder optional verwendeten Ethernet-Interface eines PC’s oder Notebooks sind für die Kommunikation optimiert und nicht für die Analyse entwickelt. Mittels eines speziellen Treibers erlaubt der Promiscuous-Mode das Monitoring, jedoch verwirft das Interface defekte oder fehlerhafte Datenpakete. Zur Überwachung der Sende- und Empfangssignale sind 2 Eingänge nötig oder der Umweg über einen SPAN Port des Switches, ein extra HUB oder eines Aggregator TAP’s. Diese Umwege haben neue oder andere Nachteile und lösen nicht das Problem. Der ProfiTAP ist eine nutzerfreundliche und effiziente Lösung. Einmal im Link integriert werden mit Wirespeed (200Mbit) alle 7 Protokoll Ebenen überwacht. Die Capture Funktion führt den Full-Duplex Datenverkehr in den Analyser zusammen. Der ProfiTAP belegt einen USB 2.0 (480Mbit) Anschluss am PC oder Notebook. Der ProfiTAP ist unsichtbar im LAN, beeinflusst nicht die Kommunikation der beobachteten Endgeräte und verhält sich neutral zu den Protokollverhandlungen bei z.B. „Auto Negotiation“ „Line Speed“ oder den „Duplex Settings“. Das Merkmal Permanent Network Link garantiert eine sichere Endgeräteverbindung ohne Paketverlust, auch bei fehlender Stromversorgung oder bei einem offenen USB Anschluss. LED’s informieren über den Datenverkehr und über CRC Fehler der Messstrecke. Die innovative Technik des ProfiTAP ermöglicht den flexiblen Einsatz mit z.B. Wireshark / EtherReal, Optiview, EtherPeek und vielen anderen Analysern. Der mitgelieferte USB Stick beinhaltet alle Treiber sowie die aktuelle Version eines frei erhältlichen Analyser und bietet Speicherkapazität für Analysedaten. ProfiTAP für einfache und sichere Analyse arbeitet non-invasiv, ohne Beeinflussung der Messstrecke und zeigt die MAC Fehler an – auch mit Ihrem Software Analyser. This application is a selectable option for the advanced user working on protocol analysis. The included program will convert the standard time to a high-resolution timing as being provided during recording. Just drag’n’drop the capture file into the Converter window and get a more precise timing for your protocol decodes. See the native Timestamp aus provided by regular capture and how things may look with running the conversion on the pre-recorded native file. After conversion the Timestamp is no more longer microsecond-based only – the new nanosecond-based Timing is shown after the conversion. 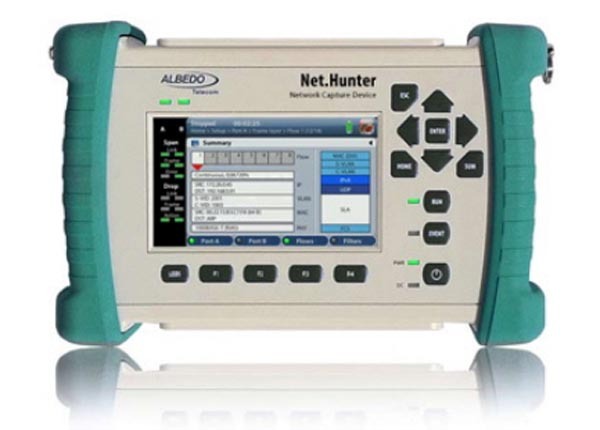 This application provides more selectable options for the advanced user working on protocol analysis. Linkspeed i.e 100Mbit on TX and RX results at the output of a AggregationTAP a total of 200Mbit (TX+RX in one stream) passed on to a analyzer NIC at a max speed of 100Mbit.This may not be a problem monitored links doing less speeds which end up in a total of 100Mbit upstream but it is a unsafe and tricky situation if packets will be lost an higher datarates. 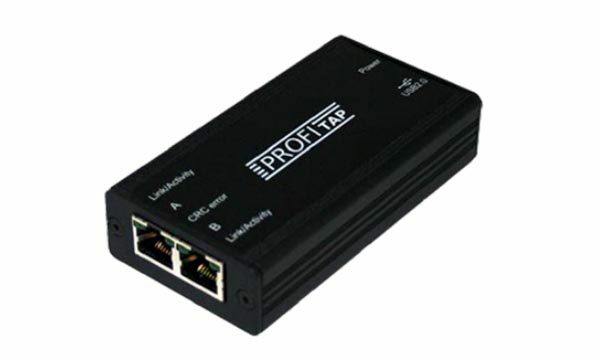 The ProfiTAP model C1AP-100-TF offers this functions aside its common usage as a standard TAP and remains to be a passive device to the monitored link. 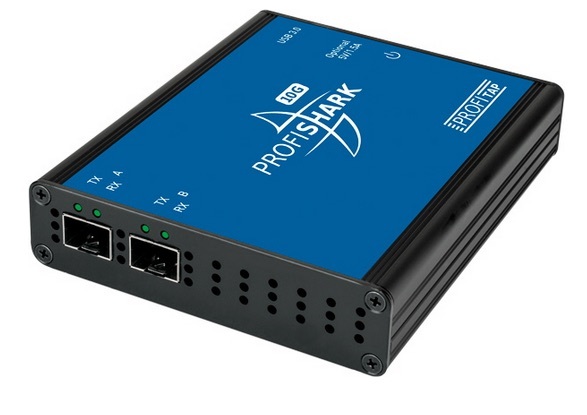 Versus other products the ProfiTAP uses USB2.0 which covers full linkspeeds (200Mbit total) upstream to the analyzer. The filtermechanic allows to cut down the upstream total traffic right on the place where it happens – at the hardwarelevel. This feature allows a better performance, a more specified usage and anaylsis of the section of data you want to build your troubleshhoting on. It may surpress unwanted data or pick out a part you focus on. In all situations this features will give a performance to your analyzer versus the usage of filterfunctions within the software analyzer. CRC error filter -this option allows the decision to keep packets corrupted by a CRC error and exclude them upstream to an Analyzer during your analysis. CRC32 remover – you may consider CRC32 bytes to be useless for any reason, this option allows the TAP to truncate this information from all packets upstream to an Analyzer. combine all filter options to one filter, i.e. protocoltype plus one MAC Adress plus IP Adress (or range).